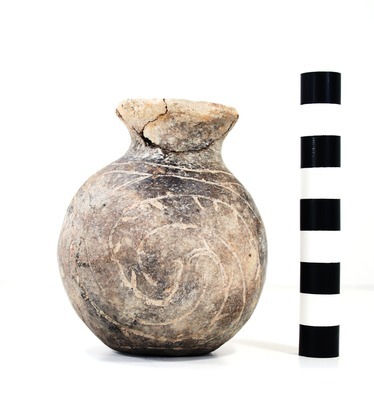 "41HS261, 2003.08.709, Burial 9, Vessel 34" by Timothy K. Perttula and Robert Z. Selden Jr.
DECORATION (INCLUDING MOTIF AND ELEMENTS WHEN APPARENT): The vessel body has an engraved scroll motif that is repeated four times around the vessel. The scrolls end in hooked arms, and one line in each encircling scroll line has small excised tick marks on it. The scrolls originate in upper and lower open triangle elements. Taylor Engraved bottle, Burial 9, Vessel No. 34, J. O. and Henry Brown site.